I finished The Unbearable Lightness of Being today. I had forty pages to go when Hebrew class ended at five, and I decided I needed to finish it before dinner. 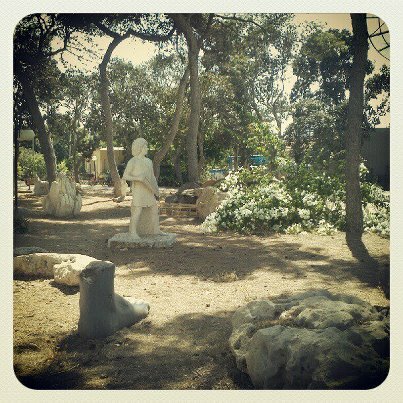 There’s a sculpture garden on the kibbutz which I absolutely adore, so I set up camp there and finished the story. Have you ever had the experience of a book coming into your life again and again, almost as though it were trying to get your attention, to tell you something? It’s been a bit like that for me. The title caught my eye the first time I saw it, years and years ago. I would see it on shelves and book lists with regularity, always wondering what it was, what it meant. I found it in my friend’s dorm room a few years ago when I went to visit him at Columbia one summer, and started reading the first few pages before I got distracted by some other activity. All the while, I could feel it hovering just outside the edges of my periphery. It returned with force last June, when a particularly fascinating young woman had a copy lying around her room. She recommended it to me, but–knowing I was struggling through a harrowing breakup–warned me against reading it. “It’ll destroy you.” She said. She had given it to others who had been recently dumped and she said that it had “destroyed them.” I was curious as to what kind of book could have such an effect to merit that word, and whether or not any book could have that kind of effect on me. I went back and forth for a while. Should I read it? Given the build up, it seemed like a good time. But was I being reckless by ignoring the warning? Another good friend of mine, a soulful man who I respect tremendously, read it for the first time that same summer. I remember seeing him breathless one morning, exclaiming that the night before he had been seized with an overwhelming desire to finish the book, and subsequently read the last 150 pages in a single nighttime session. I asked him if he thought I should read it. “No.” He said. “You’re too soon out of it [referring to the relationship]. Wait a while.” I respect these two tremendously. I decided to wait, doubtful as I was that there was really anything to fear. After all, a book is just an idea. I love ideas. This past year, the book has been on my mind. I was wondering what mysteries it contained, and what it meant for me to approach a book with caution. Did I really think an idea could possibly overwhelm me? I’ve been influenced by ideas many times over my life, often very powerfully. But I’ve always felt as is I’ve grown from them–I’ve never regretted a book, even slightly. What could this one possibly contain, to have caused these warnings? The experience of allowing myself to be governed by a fear of an idea was a source of valuable of self-knowledge. I realized that I wasn’t as intellectually fearless as I would have liked to think, and within me there’s a certain fear of the intellectual unknown. I’ve come to think of myself as someone who perpetually seeks out new experiences, and strives to expand his boundaries of knowledge. The fact that there was now a territory on my intellectual map labeled simply “Here there be dragons” was humbling. I knew that I would need to read it eventually. Not to read it would be an unacceptable surrender to fear, and would have left a mark on my character that I didn’t want. Even if the book would “destroy me,” it was a risk that needed to be borne. I hope I’m expressing clearly my thought process here. A book was presented to me, for the first time, as something to be afraid of. The notion of a book being anything other than entertainment and stimulation had never really crossed my mind in an immediate way before. Just as people become more cautious about their physical endeavors (adults tend to be more cautious than children when it comes to climbing trees) because they’re more aware of the consequences of error, so I felt for the first time that reading a book might have unintended consequences. It was a new concern, and primarily due to its novelty I didn’t want to underestimate it. So I waited, and put some more life experience under my belt. Then I picked up the book again. Having finished it, I can understand the warnings. It is very sad, in places. Most places, actually. The author weaves together a tapestry of lives resembling a funeral shroud. He builds you up almost entirely, it seems, for the pleasure of watching you fall. His treatment of his characters is harsh, yet done in a way that makes you question whether or not their stories represent real human lives in a way that our new-age, “stay positive,” “karma” based approaches to life do not. He casts the entire idea of the “left” as a grand illusion, and makes you realize that the word “senseless” is useless because it implies that at some point there was “sense” to begin with. He makes you start to question as to whether even the basic idea of “goodness” is just a wallpaper we use to cover up the bleak walls of life. The book is constantly–and convincingly–suggesting that our human connections are brittle and false, “love” is nothing but fear and need, that “principles” and “values” are almost entirely self-indulgent, and that there is no underlying order or meaning to anything that happens. Somehow, however, things end happily. After tearing away all of our masks, the author shows us that we can still smile. I closed the book feeling elated. I was very much intact, and I felt as if I had a larger view of what human lives are capable of looking like. Kundera spoke a lot of truth, I felt, and while truth can be jarring, I don’t think it can be personally destructive. If anything, I feel more… prepared for what is in store. I can understand the warnings though: for someone for whom the memory of lost love is still fresh, the negativity might be too much to bear, in much the same way that alcohol and barbiturates can be deadly. But read from a place of stability and experience, the book can give you new eyes to see the world perhaps more clearly.